We challenged DIY bloggers to dive into the new Snapfish and bring their photos home in unexpected, beautiful ways. They totally knocked our socks off! 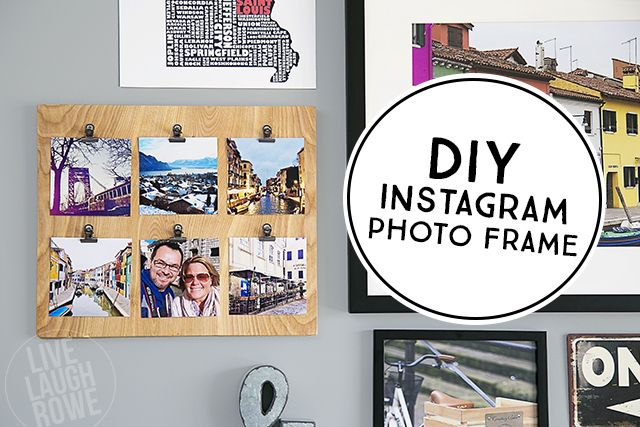 Today, we’re sharing this awesome Instagram photo frame DIY from Kelly Rowe of Live Laugh Rowe. Get pumped to make your own with her easy-to-follow instructions….we’re already on our way to the local hardware store. As you may or may not know, the hubs and I love to travel! I’ve shared a few of our adventures here on the blog such as St. Maarten, Newfoundland, Bermuda, Rome, Florence, and Venice. I recently decided that it would be fun to do a travel-themed gallery wall, using pictures from our travels along with other pieces that would complement them. I decided on a few fabulous pieces: a large matted picture, a tabletop frame, a square canvas, and a dozen or so of the 4×4 prints (using pictures from my Instagram account). 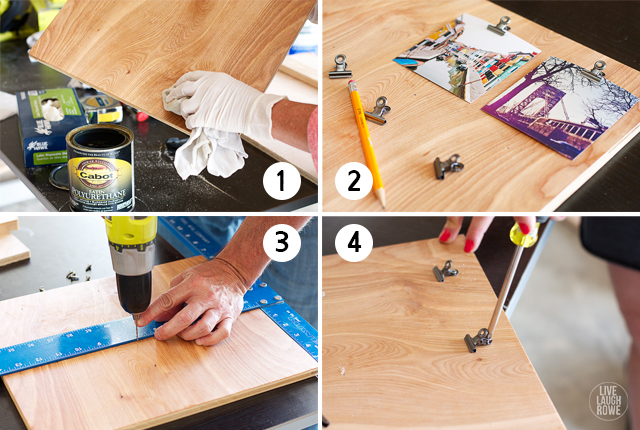 I wasn’t certain how I going to use the 4×4 prints, but I knew I wanted to make a DIY Instagram photo frame of some sort. I love making my own frames/clipboards, so it only made sense to make another version using a few of my favorite things. Let’s take a quick look at how you can whip one of these up too! Note: My board was cut and designed to fit six 4×4 prints, so we cut it to be a 12×14 in size. Feel free to customize your board to meet your needs. Step 1: Poly or stain the board. Make sure board has been sanded around the edges and on each side, if necessary. You could easily stain your board; however, I decided to keep the wood more of a raw, natural color and applied a couple coats of polyurethane. Step 2: Clip placement. Decide where you’ll be placing your pictures and clips. I decided to place mine with a horizontally-oriented board, with three pictures across in two rows. Step 4: Attach clips and sawtooth hanger. I used flat Phillips screws (6 x 1/2) to attach the clips. We then attached a sawtooth hanger on the back to mount on the wall. Pop in your photos, and you’re good to go! Thanks for sharing, Kelly! 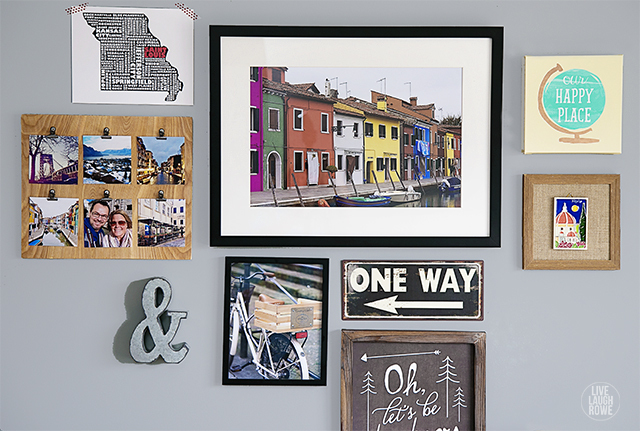 What a fabulous way to highlight your favorite travel ‘grams. Be sure to check out Live Laugh Rowe for the full blog post and more decoration inspiration. All photos courtesy of Live Laugh Rowe.